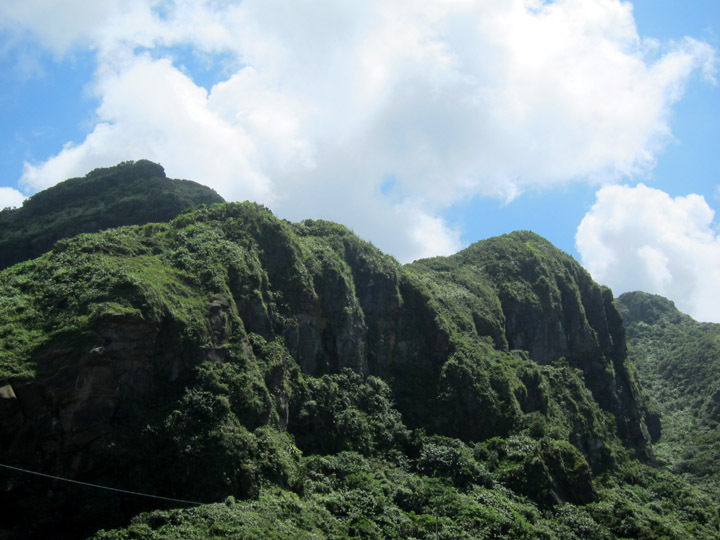 Along the north coast of Taiwan you’ll find geologically young, jagged mountains draped in a blanket of lush vegetation. Centuries of violent Pacific weather and typhoons have eroded the coastline leaving behind beautifully sculptural rock formations and the occasional sandy beach. 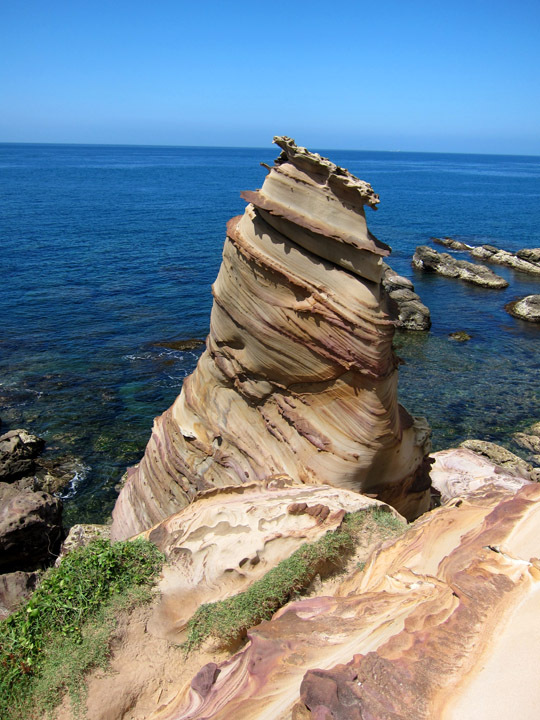 I went to see the Nanya Rock Formations but there are several notable clusters of rock formations like this along the north coast. The veins of stone have worn differently leaving behind ribbons of red, yellow, and tan material. However, given that it was about 95 F (35 C) and oppressively humid, I didn’t linger long on the shore. At least our car drove slowly along the coastal road giving some great views of the impressive landscape. 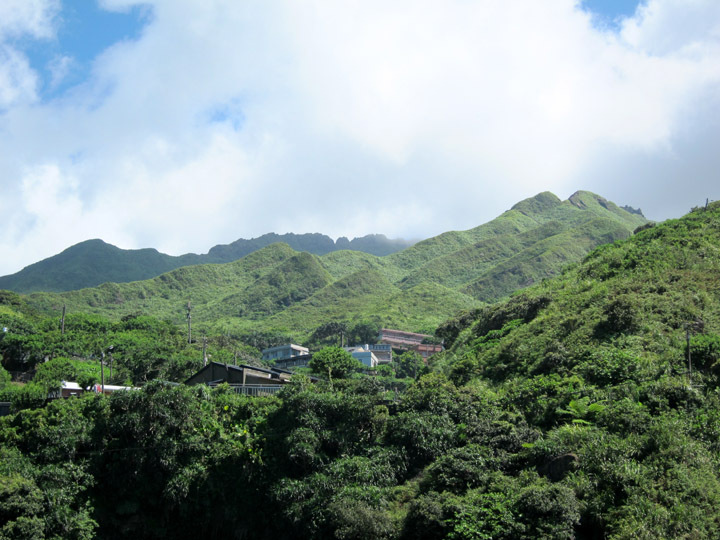 There are several hill towns hidden in these mountains, but I was on my way to Jiufen. In the 1930’s gold was found in the surrounding hills which turned this quiet village into a boomtown. Yet in about a decade the gold was done and the town emptied and was forgotten. 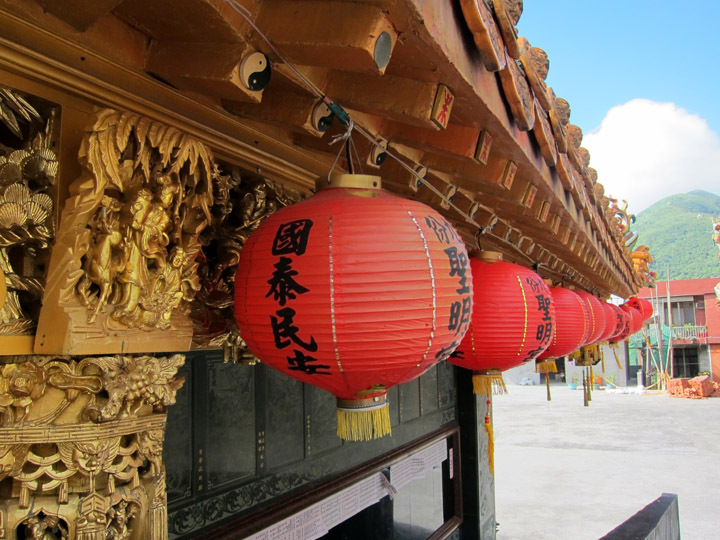 During the gold rush, Jiufen was quickly built up almost exclusively in the contemporary Japanese colonial architectural style. It’s sudden decline also preserved the unity of this design throughout the village. 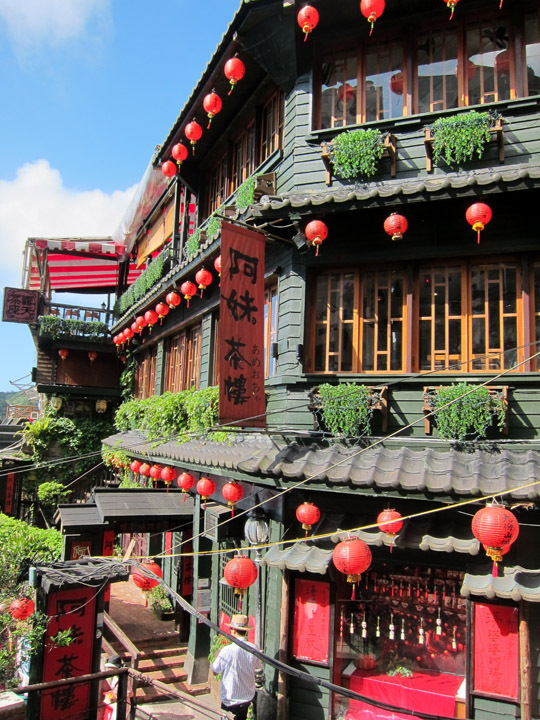 Perhaps drawn to the ghostly atmosphere here, filmmakers sought out Jiufen and featured it in two popular films: City of Sadness (1989) about the political turbulence of 1940’s Taiwan and Spirited Away (2001) which won an Oscar for Best Animated Feature. 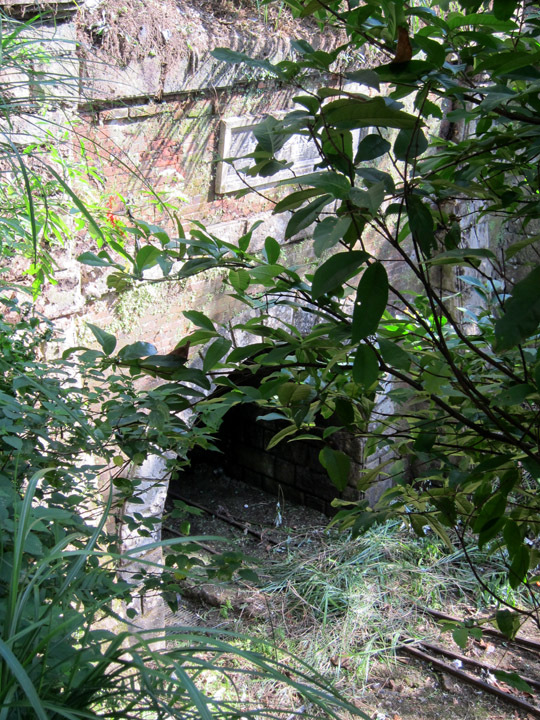 Old, weathered entrance to one of the original buildings. 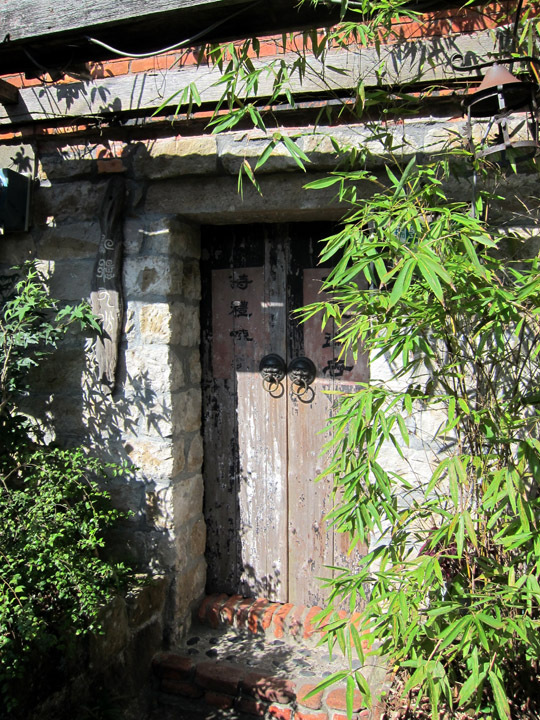 You can see this beautiful architecture in parts of Jiufen – sometimes well preserved and sometimes in its natural state of decay. Old style building near the base of the city. 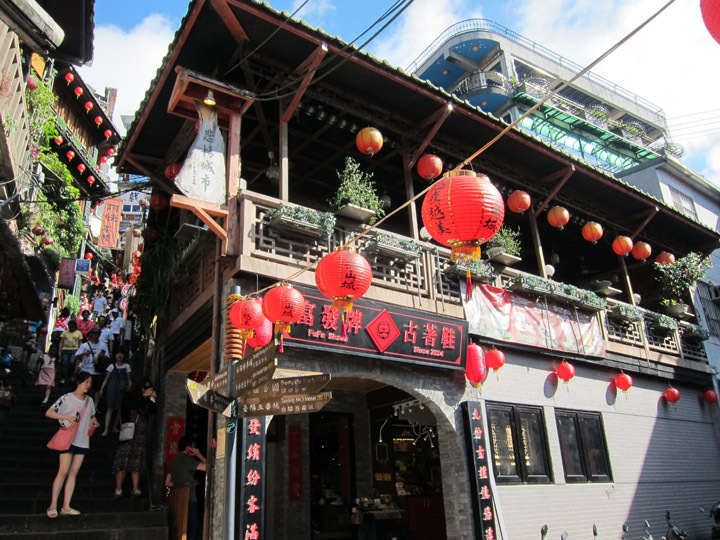 Unfortunately, Jiufen is now very popular with tourists so the architecture and quaint streets have lost some of their luster. But you do get a sense for energy of the booming gold rush town as you walk through the narrow, steep, and crowded streets. 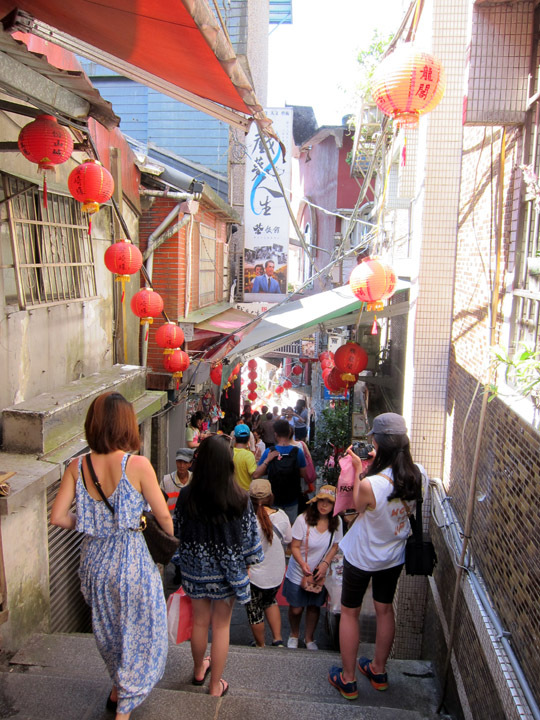 There is a long main shopping street in Jiufen which is fun to explore. 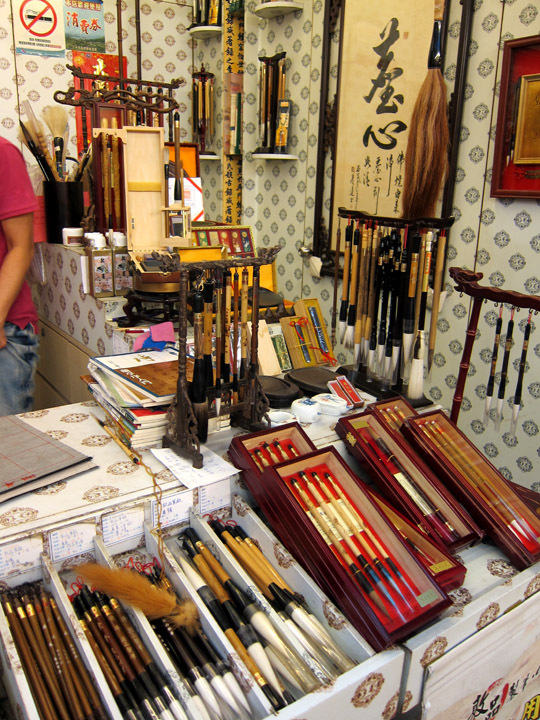 The small stalls sell everything from savory snacks to specialty teas, and from tourist knick-knacks to traditional crafts. 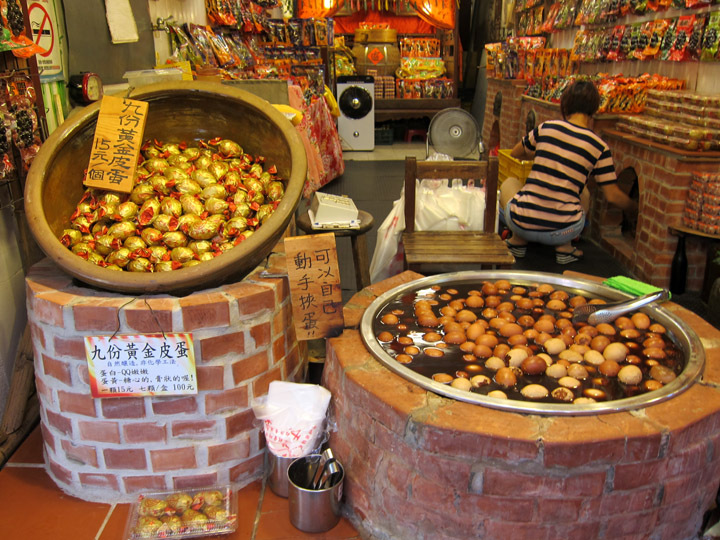 Some sort of food stall along the main shopping street in Jiufen. Looking for some cool breezes, I eventually made it to the “top” of Jiufen which had magnificent views of the surrounding mountains. Amazing little huts on the next peak over. 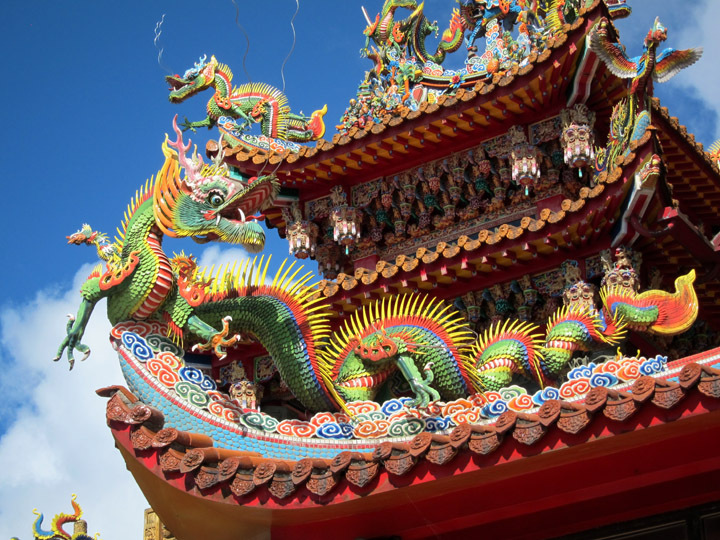 Following a sign for a temple just around the corner, I found the massive Shengming Temple. Amazingly, especially considering how crowded the streets were, the temple was completely empty so I got to explore totally on my own. 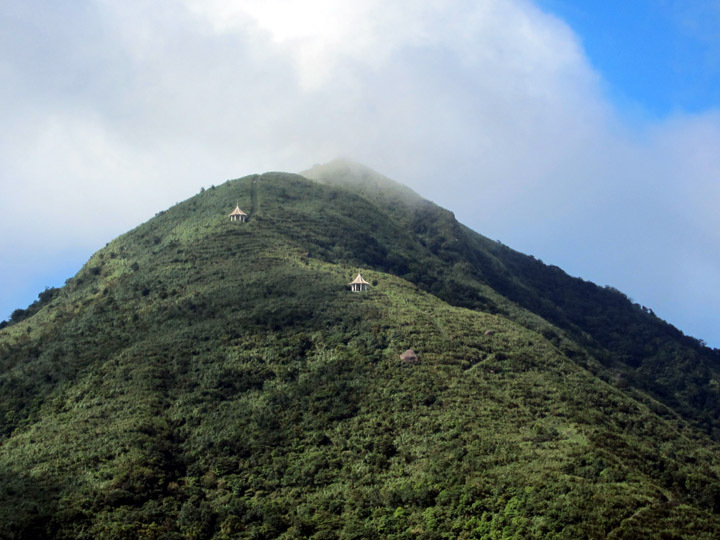 Shengming Temple and the next mountain peak over. 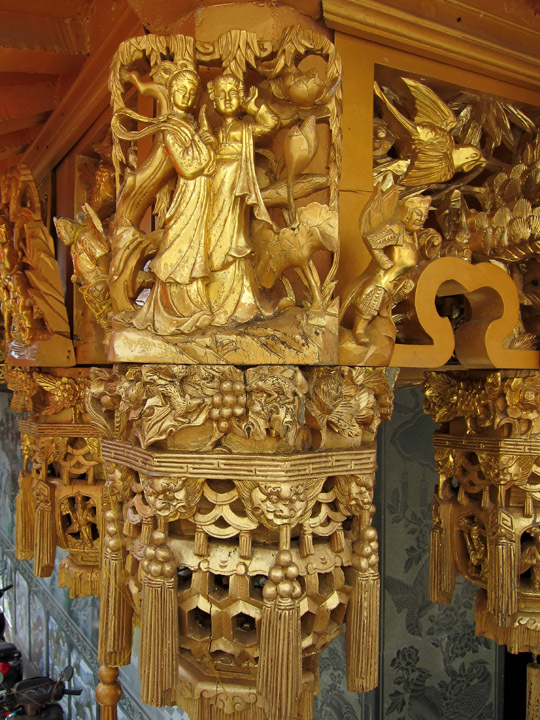 Gold carved figures amid the details of the temple’s side building. 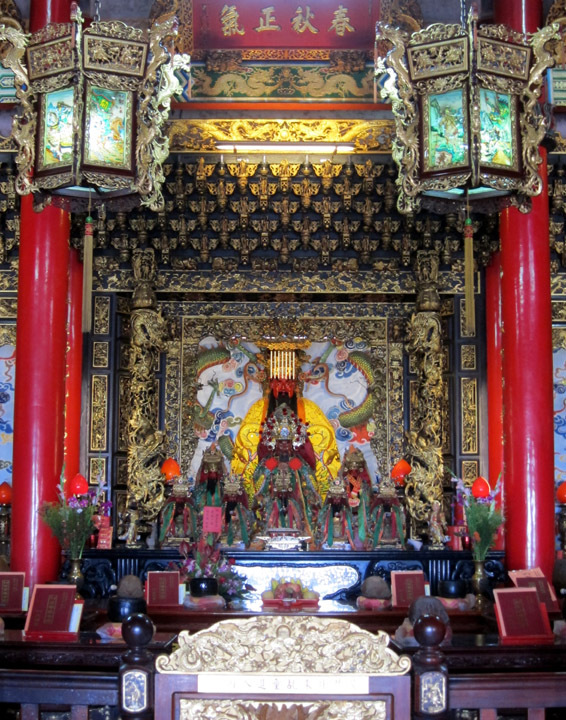 The God of Shengming Temple. While he appears to be wearing an imperial crown, I haven’t been able to determine which god this is. I wasn’t expecting much on my trip to the Bitou Cape. 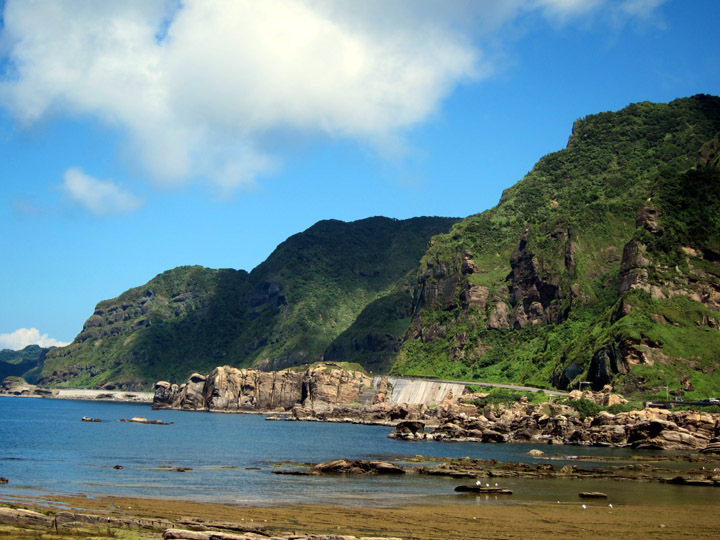 I just wanted to see the coast and a little more of the Taiwanese countryside. I ended up finding a beautifully rocky, green landscape and an architecturally unique village. 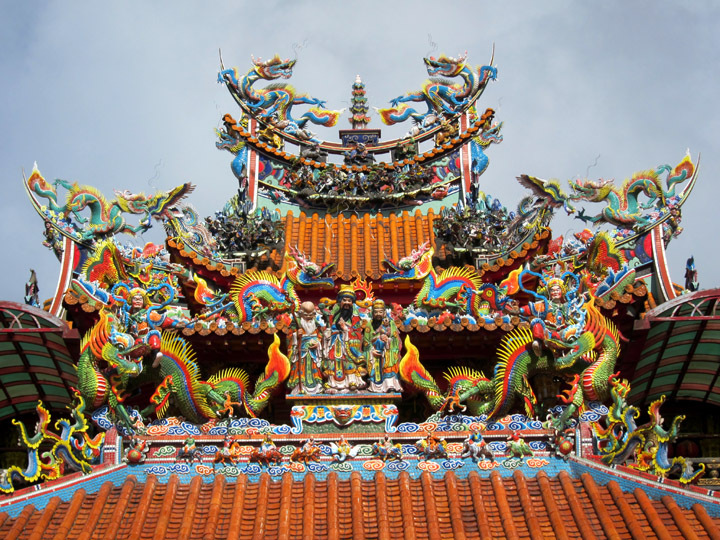 While Jiufen, overrun with visitors, suffers somewhat from its own fame, the Shengming Temple provided me with a quiet art treasure which more than made up for the crowded streets. Wow, incredible rock formations! Interesting place to read about thank-you. I’m sorry it’s got a little touristy, but I’d love to check out that paintbrush shop! Thanks Katie! 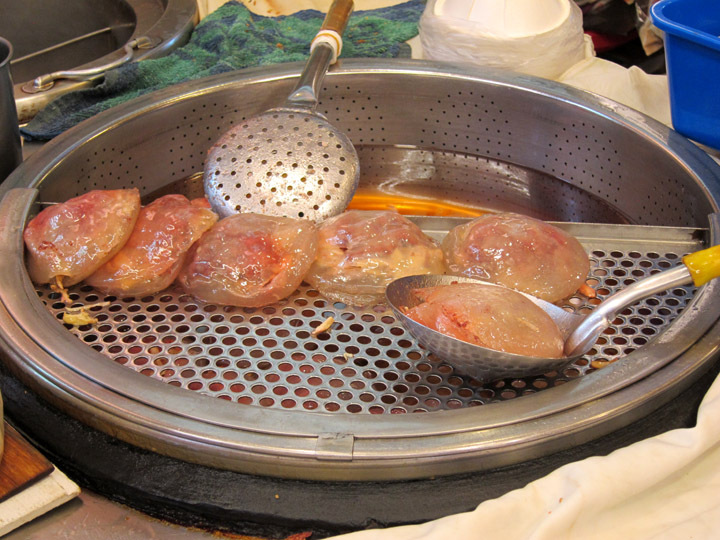 It looks like you didn’t make it to Taiwan on your last Asian adventure. Next time I guess 😉 The entire coast is dotted with similar rock formations. Definitely worth visiting! Other than being super crowded, the tourists didn’t bother me too much. They were Taiwanese visitors at least, so it was like I was seeing everyone getting out of the city for the weekend. 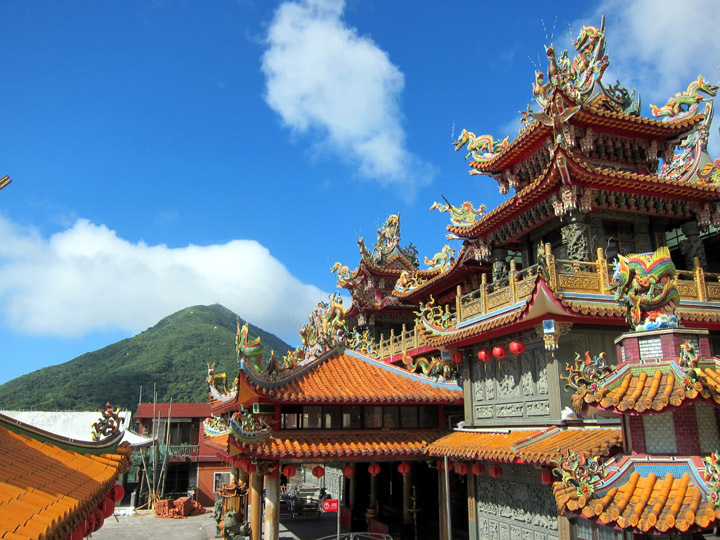 I am traveling to Taiwan on March 4th, and planning a trip to jiufen as well and when I am struggling for a good itinerary I luckily found your blog and it suits perfectly to my taste of travel. So please share your itinerary including time of travel, what type of transportation you have taken from taipei to Jiufen and again back to Jiufen. Glad to hear you will be visiting Taiwan! I really enjoyed my trip and hope you do too! I had difficulty finding public transportation that suited my schedule so I actually took a small group tour (5 people). 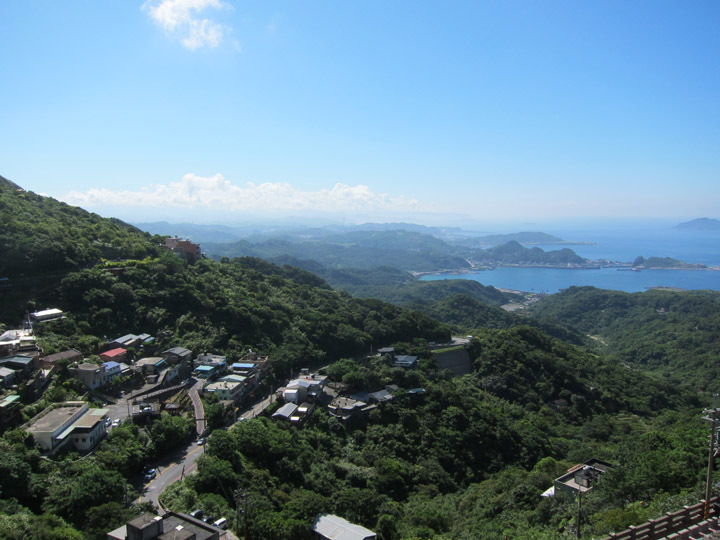 The company I booked with provided transportation to the cape and Jiufen. 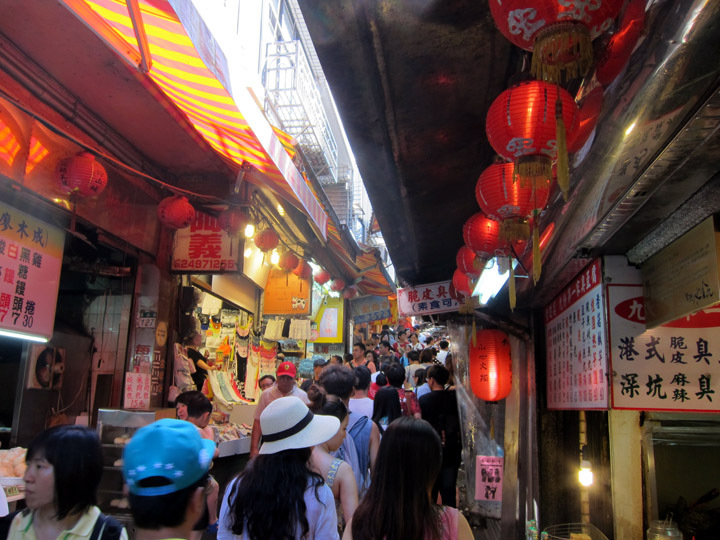 While in Jiufen, we are allowed to wander on our own for a few hours which suited my travel style. (I am not one to follow tour guides generally!) This option worked quite well for me; I would definitely recommend a small tour company. 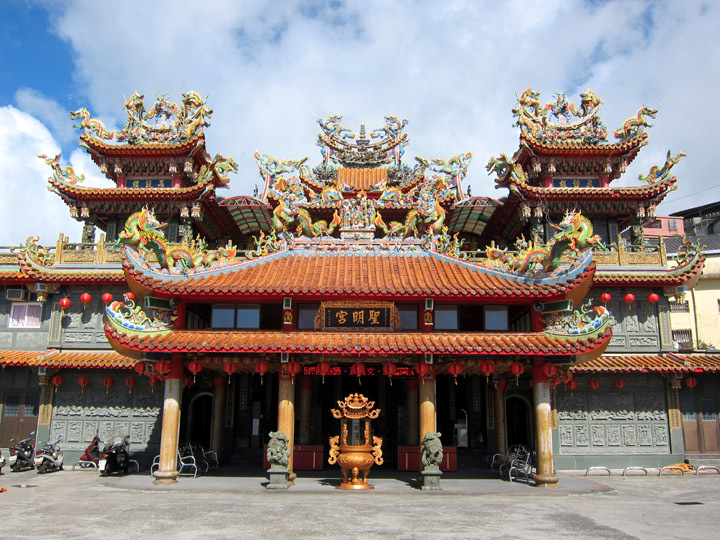 There are several that offer half and full day trips from Taipei and I think are all pretty equivalent. I would recommend that you see the reviews on TripAdvisor and select a tour that suits your schedule and price point.